For the dressing: whisk together tahini and water until you have a smooth paste. It should not be too thick, or too runny. Whisk in other ingredients and set aside. Combine shredded and chopped vegetables in a mixing bowl. Add dressing and mix well. Refrigerate for several hours before serving for best results. However, this is still very good if eaten right away. In a dutch oven, bring a boil the two cups of water and bouillon cube. Add frozen vegan chicken and hearts of palm. Cook on medium about 10 minutes or until the “chicken” is tender. Remove “chicken” from pot and allow to cool. Drain hearts of palm in a colander and set aside. Slice the “chicken” very thinly, or shred with a food processor. In the dutch oven, combine all remaining ingredients *except* liquid smoke. Return the “chicken” and hearts of palm to the pot and mix well. Cover and marinate 6-12 hours. To cook: preheat oven to 350. Add liquid smoke and cook covered for 1 hour. Serve with coleslaw. 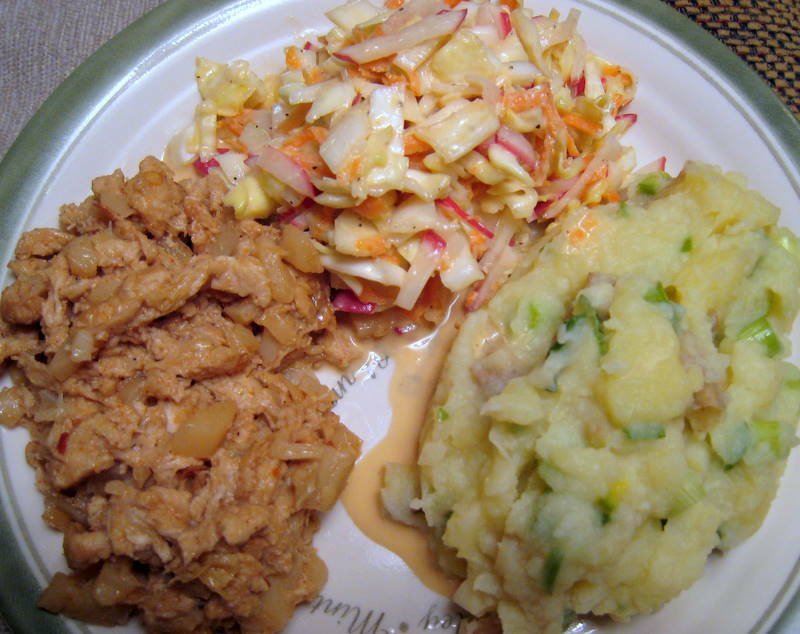 This entry was posted in barbecue, cabbage, salad, vegan, vinegar and tagged coleslaw, north carolina barbecue, vegan by Beans, Figs and Katz. Bookmark the permalink.